Lymphedema is a swelling due to abnormal buildup of fluid in body tissues that can occur when the lymphatic system is improperly developed or damaged through trauma or injury. Often becoming a chronic condition, it occurs most frequently in the limbs but can affect other parts of the body. 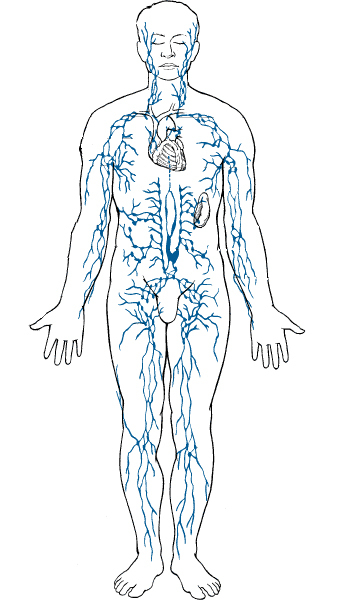 The lymphatic system plays an important role in the immune system and helps maintain the balance of fluids in the body. Lymph nodes filter out harmful cells for removal by the body’s defense system. Lymph vessels carry lymph, composed of fluid, protein and cellular products, from body tissues back towards the heart. Lymph flow is aided by contraction of lymph vessels, muscle movement during exercise, and deep breathing. There are two main types of lymphedema: primary and secondary. Primary lymphedema, due to a congenital defect, appears at birth or later in life. Secondary lymphedema occurs when the lymphatic system is damaged as a result of trauma, surgery, or radiation. It can be a side effect of cancer-related surgeries that require the removal of lymph nodes. Lymphedema may occur months or years after treatment. Lymphedema can also occur as a side effect of other conditions such as chronic venous insufficiency or severe obesity. Increased swelling on hot, humid days or after exertion. Do not ignore symptoms. See your doctor or a specialized lymphedema therapist for an evaluation. Early treatment helps minimize swelling and reduce complications. Infection, called cellulitis or erysipelas, is the greatest danger and requires urgent antibiotic treatment. Treatment goals are to reduce swelling by compression and to improve lymphatic drainage. Your therapist will evaluate the stage and severity of the lymphedema and consider your medical history before proposing an individual treatment plan. Learning how to manage your lymphedema through continuing self-care is vital to treatment success. Your therapist should provide education, tools and resources to guide you.